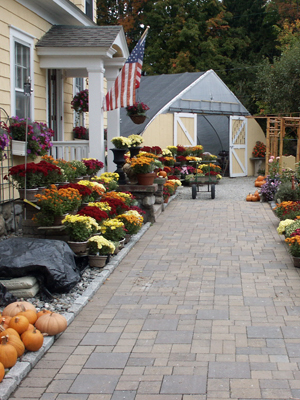 Millbrook Gardens and Landscaping has been a leader in the field since its 1979 founding as Rollins Landscaping. The business was purchased in 2013 by Hudson Valley native Patrick Murphy. Patrick brings a unique set of skills to the landscape design, construction and care industry, combining a love of Dutchess County’s rolling terrain with 25 years in the construction and fine masonry business, where he specialized in historic restoration and preservation. The business has won acclaim over its 37-year history for creating distinctive designs, and executing them with quality materials and superior workmanship. Our garden shop and retail yard, fixtures on Route 44 in Mabbetsville, stock high-quality products and materials from outdoor furniture to topsoil, and offer a consistently high level of service from our welcoming staff. Part of what sets Millbrook Gardens apart is our approach to our customers. We love our work, and we enjoy passing our passion along. Whether its designing and building the landscape look you’ve dreamed of for your home, or selecting tools and decorative items for your gardening needs, we are here for you. Across our businesses—in the shop, or out in the field on landscape design, installation and maintenance jobs—we promise excellence, and over a span of nearly 40 years, we’ve delivered on that commitment.